Lift Therapy Sublime Lifht Night 1.02 fl. oz. Flaccidity is the loss of firmness in the skin and this happens for a number of reasons, among them and foremost is the passage of time, but there are other factors apart from aging and these may include stress, lifestyle and excessive exposure to the sun. The main cause of flaccidity of the skin is the loss of collagen, elastin and hyaluronic acid, substances which provide support, elasticity and firmness for the skin. A firm face needs the combination of good cell structure together with the physiology of balanced skin. 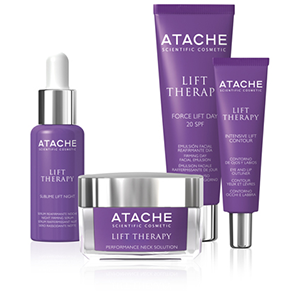 Beyond the surface action, Lift Therapy works as a natural lifting effect through all the skin's layers. ATACHE Laboratories offers this new facial line which is especially designed to combat the loss of firmness and reshape lost volume.